dirt bike trailer with no suspension? I needed a trailer for one bike in a big way 10 years ago. After looking at the crap that was for sale at $1800 plus I decided to build my own. I used a single torsion axle rated at 2000 lbs and 13 inch wheels that fit a Chevy bolt pattern. 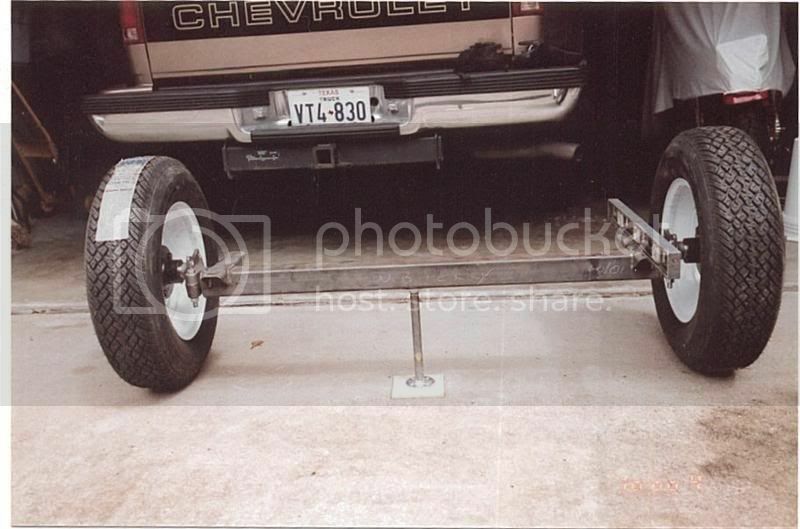 The footprint of the trailer is 30 x 62 inches and the four dolly wheels on the ramp allow me to roll it around easily. 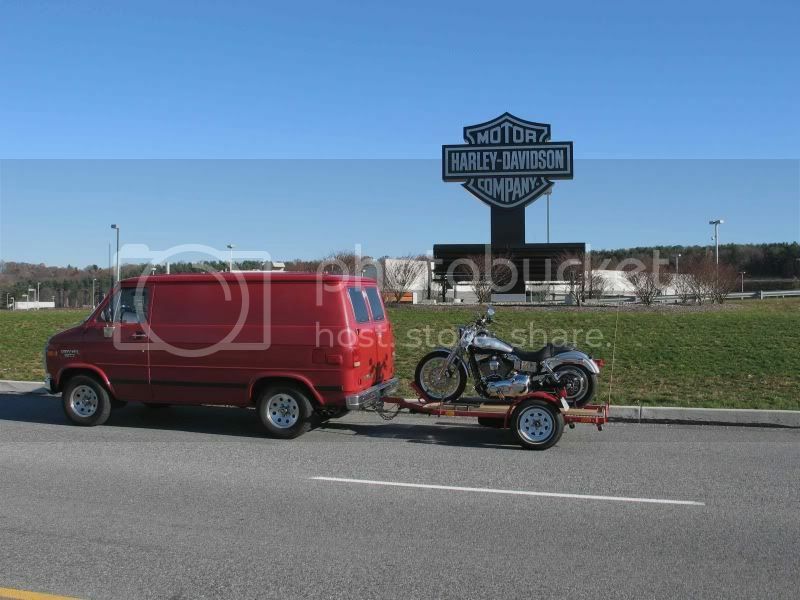 This trailer in the past 10 years has been coast to coast several times and from Texas to York PA and back when I picked up my new Harley Dynaglide in 2005, pulling an empty trailer from Texas to York and returning with a full trailer as shown above. My wife loved that trip, as we made it at Thanksgiving weekend. Rockwell/Delta Planer, HD Shaper, Uni-Saw etc. Now that is what a talented fabricator can do. Torsion axle, and the wheels need to be as wide as the car. They do for me anyway, so I can see them in the mirrors when backing or backing the car to hook up the trailer. 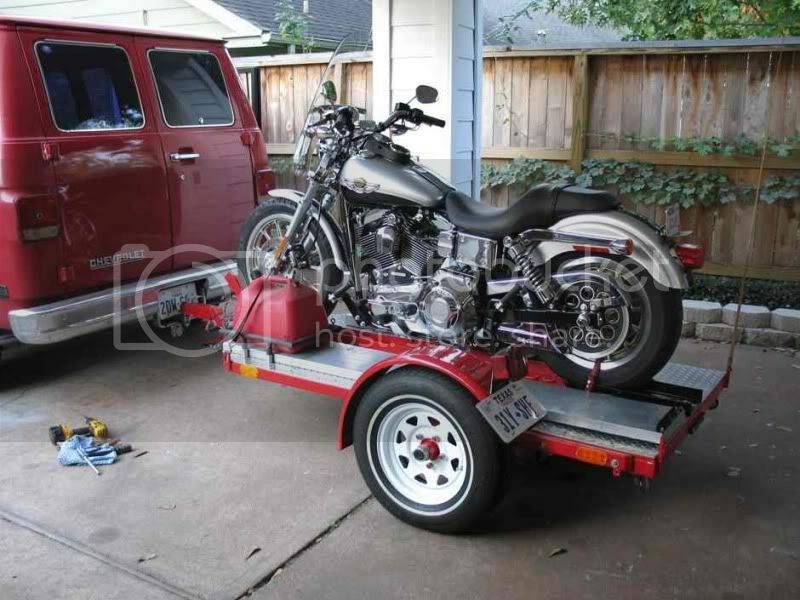 If you look close at the pic of the bike on the trailer you can see a fiberglas fishing rod attached to the right rear of the trailer. This is my 'vertical curb feeler'. Like an antenna. When I have no bike on there, I use this to guide me. Works like a charm. I wanted a trailer that I can roll around inside a garage, not have it take up 3/4 of a parking space. 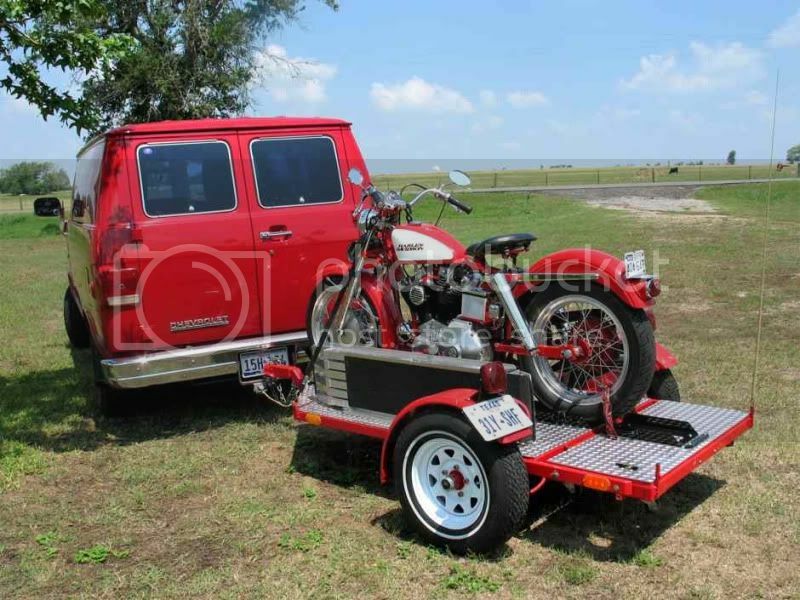 That is the prettiest motorcycle trailer Ive seen. Any chance you could post a schematic/plans of your project? 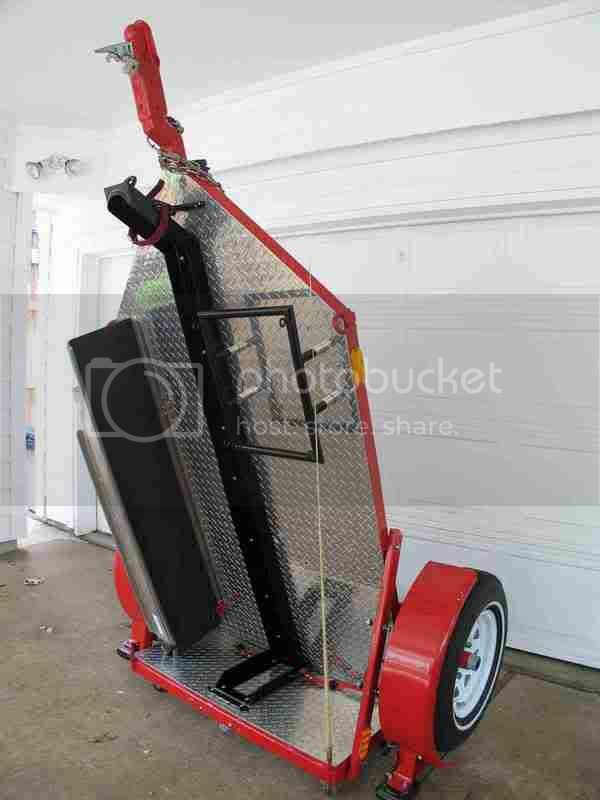 Id like to try to build a motorcycle trailer sooner then later. I made a plastic model for the plans. I will see if I can find that and take a pic of it. Also, I made sketches as I went so I will look to see if I have anything of value and be glad to post it or send it to you in an easier to read form.......... a.k.a. PDF file. Here is about all I have on the trailer fabrication. 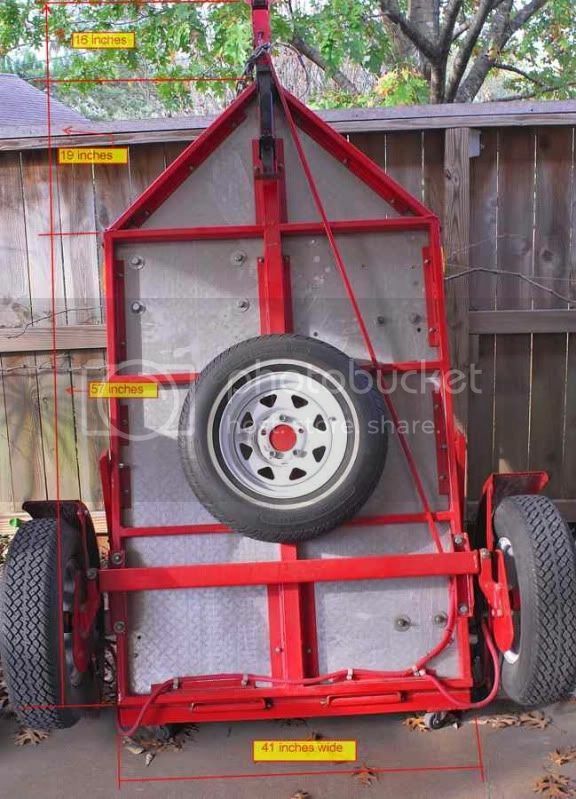 At the time I did a write up on it which describes the different member sizes I used and a lot of explanation of the features of the trailer, folding it up and setting it ready to haul a bike. The set up takes me about 30 minutes. That write up is in PDF form and I cannot post that here on the forum. If you want it, just email me and ask. I will be glad to send it to you. 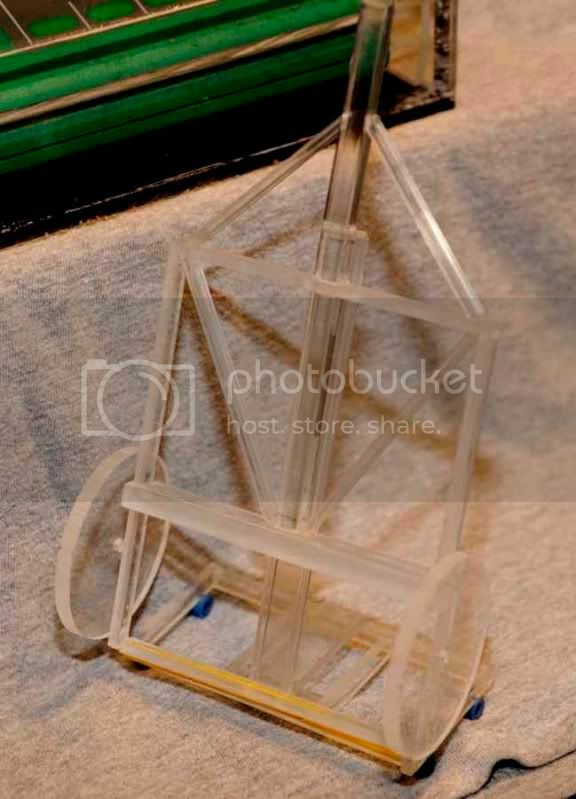 As I said before, as far as drawing up plans, I just made a plastic scale model of what I wanted to build. The 'tailgate piece' is 18 inches by 41 inches. I made hinges out of stainless steel tube and stainless rod as the hinge pin. 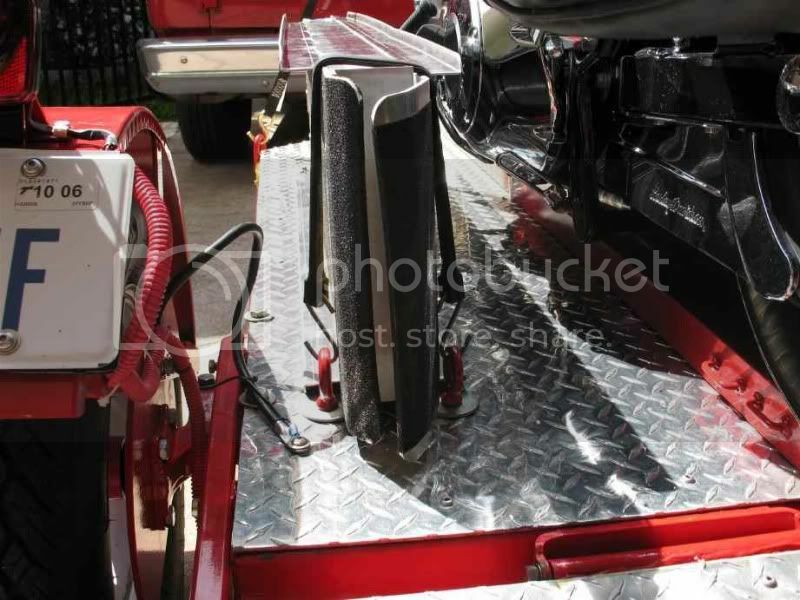 The two struts hold it in the folded position and removing two 3/8 bolts on each strut allows the trailer tailgate to drop to a level position and the struts are bolted on each side to the tailgate and the trailer, using (4) 3/8 inch bolts on each side. To take the trailer from an upright position to horizontal all you have to do is grab the spare tire and pull it toward you. The big tires touch the ground as the (4) dolly wheels under the tailgate leave the ground. Very easy to do. Reverse this to take it to the folded position. It takes me 30 minutes go from folded to ready to load a bike. Thanks for posting more info. very clever with the plastic modal. I did want to ask you a question-what is the distance from the center line if the axle to rear of the trailer? Any problems with the trailer fishtailing? Also, what size members are the trailer rails? I used 1 inch angle for the tabs to attach the aluminum deck. The deck is a sheet of 4ft x 8ft x .125 thick aluminum engine plate. For the track holding the bike wheels I used a pair of 2 inch angles welded together with a strip of metal between the edges. I made the front section 4-1/2 in width and the rear section 5 inches in width, because most bikes have smaller front tires. A big Harley Road King being the exception of course. Now notice in each pic where the rear wheel falls on each of the different bikes. The YZ sits entirely on the trailer frame. The old Sportster sits at about the same place. And the Dyna sits entirely on the tailgate piece. The axle I had made up at Southwest Wheel. They are located in Amarillo TX and have a branch in Dallas. I did the order entirely by Internet and they shipped to the truck terminal in Houston where I picked it up. I ordered the axle, 2 fenders, 2 wheels and 2 tires. I made my own axle backing plates out of 3/8 inch plate and also made the fender braces. From the centerline of the axle to the rear of the trailer (frame) is a distance of 14-3/4 inches. The tailgate piece adds another 18 inches to the trailer's length. I chose the location of the axle by simply lifting up the tongue end of the trailer. My starting point was the center of gravity of the Sportster. Then I favored about 25 lbs added to the tongue weight on the trailer. That was perfect. This trailer does not fishtail.........EVER! It makes no difference which bike I am hauling, the trailer tracks straight and true. You don't ever feel that you are pulling a trailer at all. The trailer may seem narrow to some of you at 43 inches but I assure you this thing will never turn over. The torsion axle has it sitting low to the ground which is also the way you want it for loading the bike. I sometimes ride the Dyna up the ramp onto the trailer. In eight feet you have to make a very quick stop of course! If I had to make any negative comment about this trailer, all I could say is because it is only 8ft long it is a bit difficult to back up. It turns quick. 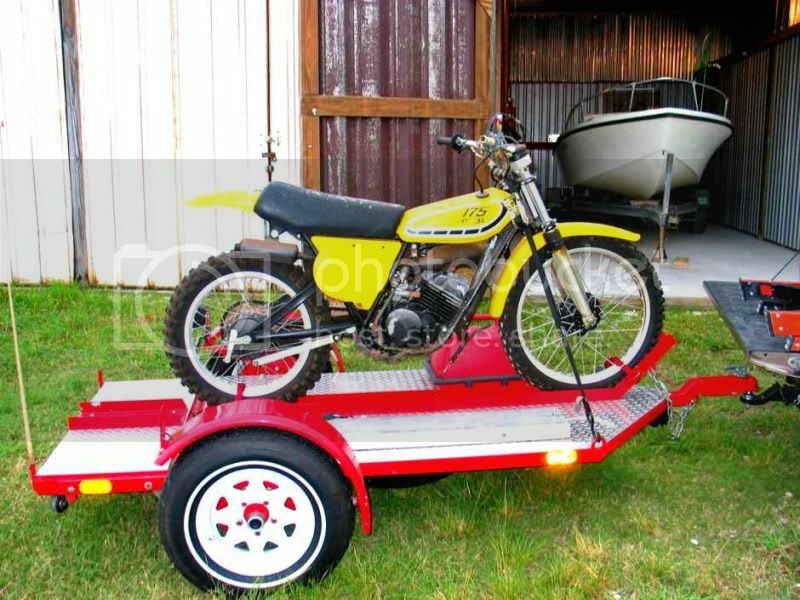 If a bike is on the trailer then no problem. But without a bike loaded I cannot see the trailer out of the van windows or mirrors. So to take care of that I attached a fiberglas fishing rod to the right rear corner. That tells me where the trailer's corner is at. Since those first months of pulling the trailer though I have removed the fiberglas rod (I broke it off actually) and now no longer need it. I will send you that PDF writeup to your email and if you have any more questions then you can just email me direct. Nice dirt bike by the way (what is it?). Thanks for the PDF you sent. Question-is the 8 feet from the rear of the trailer to the front of the Motorcycle tire? Also, when you say the trailer width is 43 inches-is that also the same dimension as outside to outside of Axle hangers? When you ordered the axle what dimensions did you ask for/spec? I just went back and re-read your previous thread more carefully-I found the answers to questions 1&2. Do you need the 3/8 inch backing plate at the axles though? what is there main purpose (again Im new to this)? When I ordered the axle the fellow kept asking me how long I wanted the axle to be. I told him the outside width of the trailer was 43 inches. He would come back asking me how long I wanted the axle to be. We went back and forth on this until I finally realized why he kept this up. He was wanting me to specify how much room between the trailer side and the inside of the hub there needed to be. He finally accepted this and told me there was no return on the axle if it did not fit correctly and I said fine. At that point I had not started the frame construction yet and thought I would adjust my dimensions as needed when I got the axle. The axle was absolutely a perfect fit. They weld on the mounting clips to meet the frame dimensions you give them. The only reason I used 3/8 plate on the axles was to provide a strong mount plate for each fender. This required me to drill a large hole using a hole saw through each plate to go over each spindle. There are other ways to do this, but the plate was easy for me. The pic below shows me cutting one of the plates with a plasma. The other finished plate is mounted in the vise with an arrow pointing to it. The 'flat' on the bottom of the plate in the vise serves no real purpose. The reason it is there is because of the size of the 3/8 inch plate I had on hand. As it worked out though, it does provide some extra ground clearance be low the axle. Not planned though, that just happened. 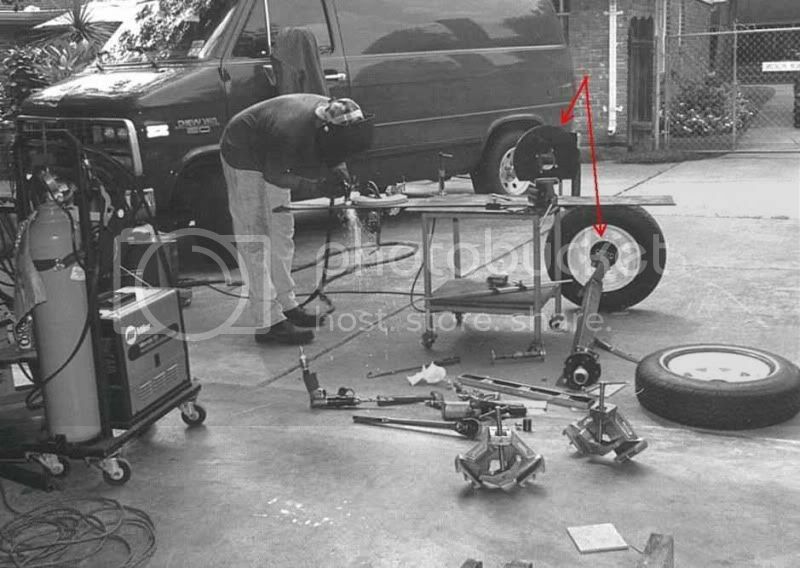 The other arrow points to the axle where the plates attach with 4 bolts. The plate with the 4 holes will come as part of your axle and you could use these holes to mount a fender rather than using the 3'8 inch plates as I have done. Different ways to skin the same cat. Until I dug out this pic to post I had forgotten that I started this trailer fabrication using the only Mig machine I owned at the time........ a Millermatic 130. The small machine was used to make 80% of the trailer but before I finished I had purchased a new MM251 and that made things a bit easier to finish the project! 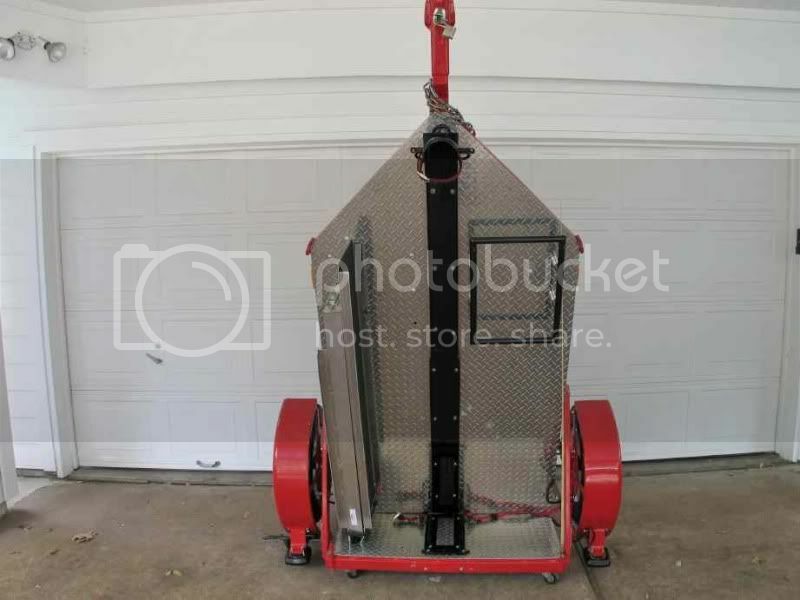 I would like to fabricate a 'V' nose for my 6'x10' enclosed trailer to travel to Florida from New York state. Any help can be used. Maybe front doors to load lite items.